Exposing the religious roots of our ostensibly godless age, Michael Allen Gillespie reveals in this landmark study that modernity is much less secular than conventional wisdom suggests. Taking as his starting point the collapse of the medieval world, Gillespie argues that from the very beginning, moderns sought not to eliminate religion but to support a new view of religion and its place in human life. 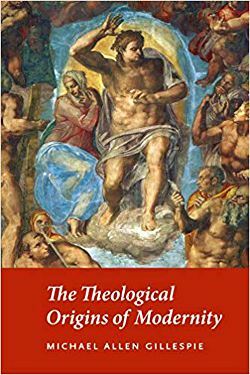 He goes on to explore the ideas of such figures as William of Ockham, Petrarch, Erasmus, Luther, Descartes, and Hobbes, showing that modernity is best understood as a series of attempts to formulate a new and coherent metaphysics or theology.